At a certain point, somewhere around mid-January, New Year’s wishes finally reach their sell-by date. Fortunately for us, pics from the holiday office party never go bad! 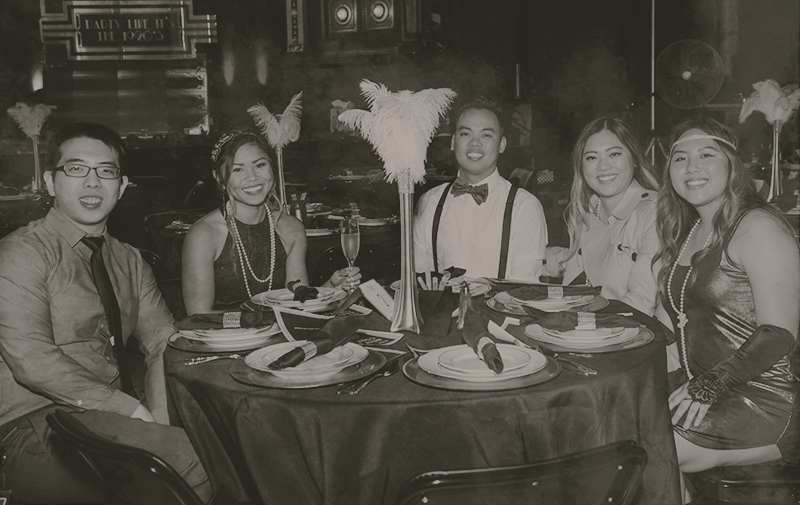 Especially not when the soirée in question was as a brilliantly conceived and historically epic as Freenome’s Roaring Twenties party, held back in mid December at Broadway Studios in the Financial District—the perfect way to unwind and celebrate an eventful year. Rather than use this lead in as a shameless opportunity to share a laundry list of company milestones achieved in 2018 (like the first data readout from the largest international, multi-center study to date using cell-free DNA to accurately predict early-stage colorectal cancer, the more than 5000 blood samples we processed, or the nearly 3000 patients enrolled in our prospective AI-EMERGE study) we know you’re really just here for the pictures. So, without further ado, here’s looking at you, Freenome! Obviously the first reason to have a 1920s themed party is to give people a reason to get fancy, not that anyone here needed much convincing. While wearing a lab coat may have certain advantages when it comes to your morning routine, it quickly became clear that, by night, Freenomers like to strut their stuff—at least judging by the goings on at our photo wall, the most popular spot in town to see and be seen. The competition for best costume was stiff, but, in the end, only one could wear the crown, and he spent most of last year in the Verily gym training for it. Congratulations to Derek for finally overcoming his shyness and letting his inner flapper flag fly! Naturally, there were the cocktails. We chose a few of our favorites and gave them a twist in honor of our dapper founders Riley Ennis (French 75, a.k.a The Fizzy Ennis] and Gabe Otte [Shirley Temple, a.k.a. The Great Gabesby]. We’re not sure if his signature drink had anything to do with it, but Riley was definitely speaking easy as he kicked off the formal dinner with some heartfelt words on finding success through experimentation, listening to one another, and the power of seeking truth in everything we do. Cheers to that! Freenome’s rapid growth last year has been a great thing for our mission, but it also means we don’t see some of our favorite coworkers as much as we’d like to. The sit-down dinner was our chance to slow down and catch up, as well as introduce our partners, spouses, and significant others to some of the other special people we spend so many waking hours with. While Freenome clearly had a fantastic time wrapping up 2018, we couldn’t be more excited for 2019. Thanks for following along with us on this journey. There’s a lot of hard work ahead, but the goal of detecting cancer at its earliest, most treatable stages is worth every bit of hard work. We’ll be in touch when there’s more to celebrate!